If you’ve ever blogged, it’s probably happened to you: You’re in your coffee-shop office, typing away, when you need to print something–a contract, a transcript to read over–what do you do? Abandon your post and hoof it to that tenth circle of hell, Kinkos. Well no more. Check out this tiny, portable printer from PlanOn. 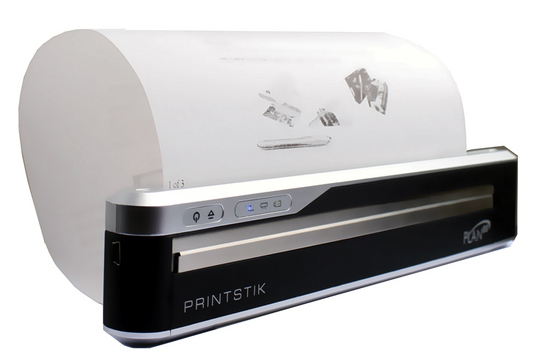 The Printstik weighs about a tenth of a pound, it’s battery-powered, and it prints from PCs and Blackberrys wirelessly (Mac users need virtual PC software). But the coolest thing is that it prints without ink. Thermal printing has been around for ages, but has never really caught on. 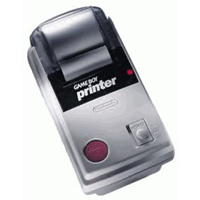 Remember the Game Boy printer” Didn’t think so. Why not” Well, it’s kind of expensive, first of all. You don’t have to buy ink, but you do need to use special, heat-sensitive paper. (The Printstik uses a proprietary paper cartridge of 20 pages.) Because it’s heat-sensitive, whatever you print won’t be permanent–PlanOn’s paper lasts for seven years. Also, you can only print in black-and-white. After years of home printers trying to be as photo-realistic as possible, it’s interesting to see the Good Enough Revolution in effect here. With our computing all going mobile, it doesn’t make sense anymore to have a big, heavy printer at home–no matter how good its resolution. The inkless printing is a nice touch (no need for quick fixes like ecofont to save resources), and the fact that it only holds 20 pages at a time seems like a drag, until you think about how many pages you’re really printing while you’re out and about every day. It’s meant to be there when you really need it–and no, printing out that 100-page screenplay you’d “really like my thoughts on” doesn’t count.